This is the beginning of my experience with TVL/BBC letters. 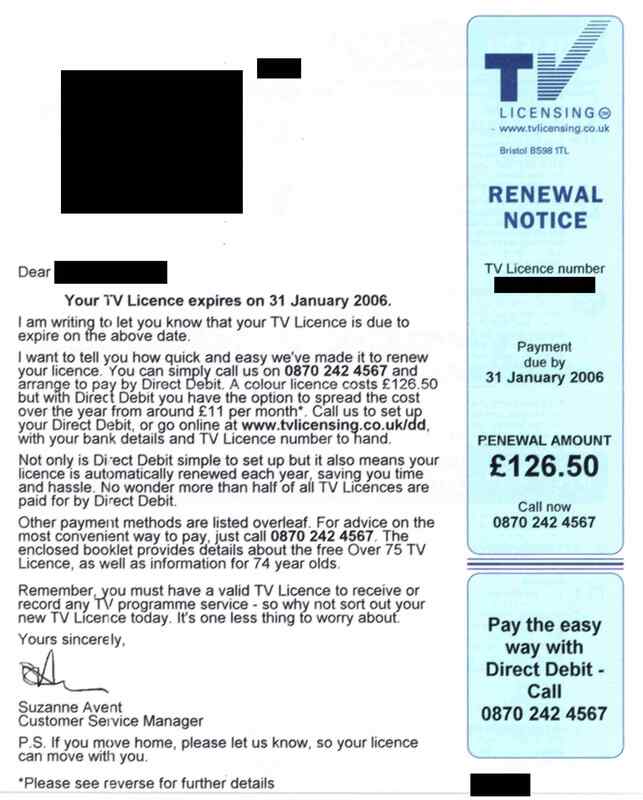 My licence expired in January 2006 and, in anticipation of me buying a new one, TVL/BBC sent me the following renewal notice. Since I had already decided I would no longer be a customer of theirs, I did not take them up on the offer. A month later, I received an "overdue" notice. I might expect an overdue notice for a product I use, such as gas or electricity. But I do not see why I should be considered "overdue" for a product I no longer use, by an organisation of which I am not a customer. 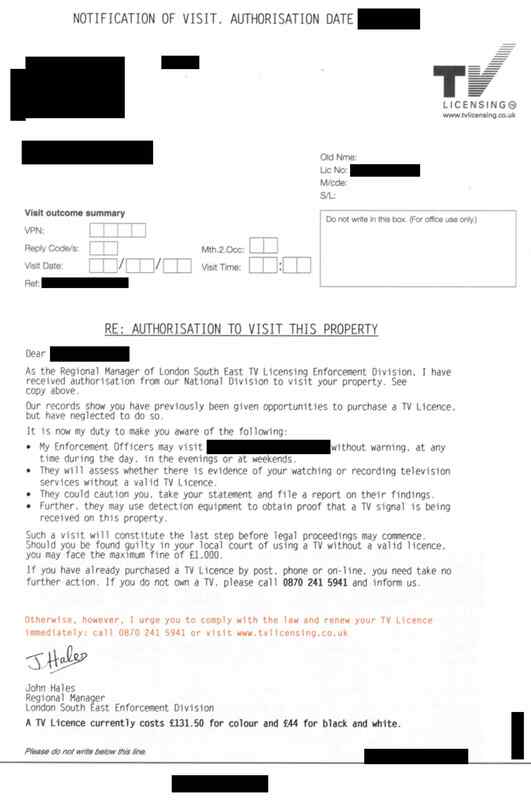 The letter says that if my payment is not received shortly, my details will be passed to a TVL officer. Note that the right hand side is coloured red, as if to emphasise this is a final reminder. I decide to ignore this impertinent letter. The below envelope was waiting for me when I got home from work. For a moment, I was worried. The words "You are hereby given official notice" are part of the letter inside, visible through a window. I must be in trouble. The letter says that my "case" has been referred to the "investigation unit". But this letter is not all it seems. The giveaway is in the first word of the second paragraph, "if". This means they don't really know whether I watch broadcast television. So, the letter is a bluff, relying on the use of red capitials and words such as 'hereby' and 'official' to intimidate. A different type of envelope. 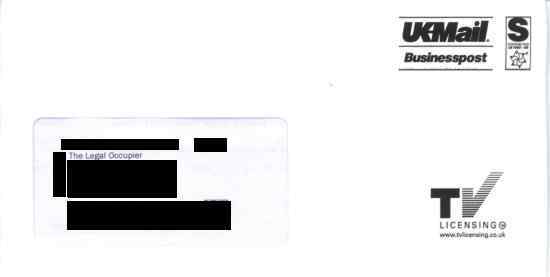 The message on the front of the envelope is a warning, but why address it to me? The implication is that I am engaged in criminal activity. I assume that the purpose of such a statement is to alarm me, or perhaps embarrass me in front of the postman. 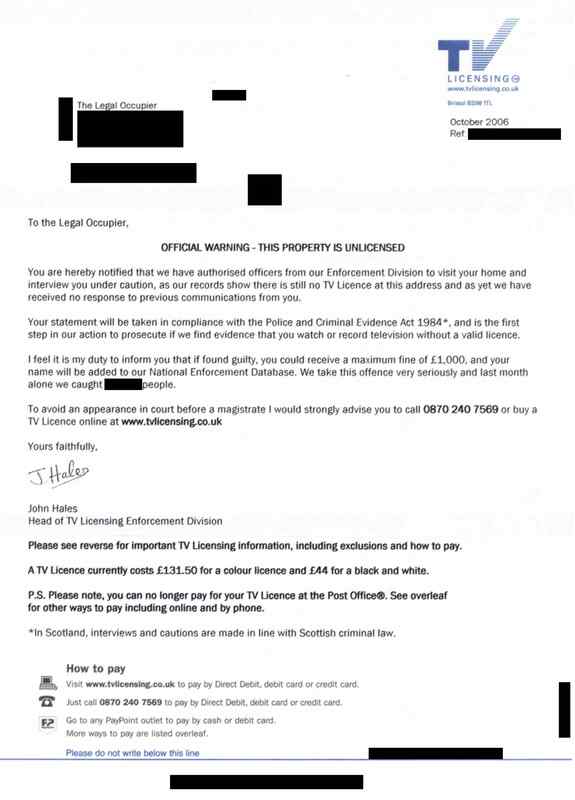 The letter tells me that "Enforcement Officers" could visit my street at any time, including evenings and weekends. There seem to be more reference numbers than is really necessary. Note the sentence: "Such a visit will constitute the last step before legal proceedings may commence". The use of the word 'may' negates 'will', thereby rendering the sentence meaningless. 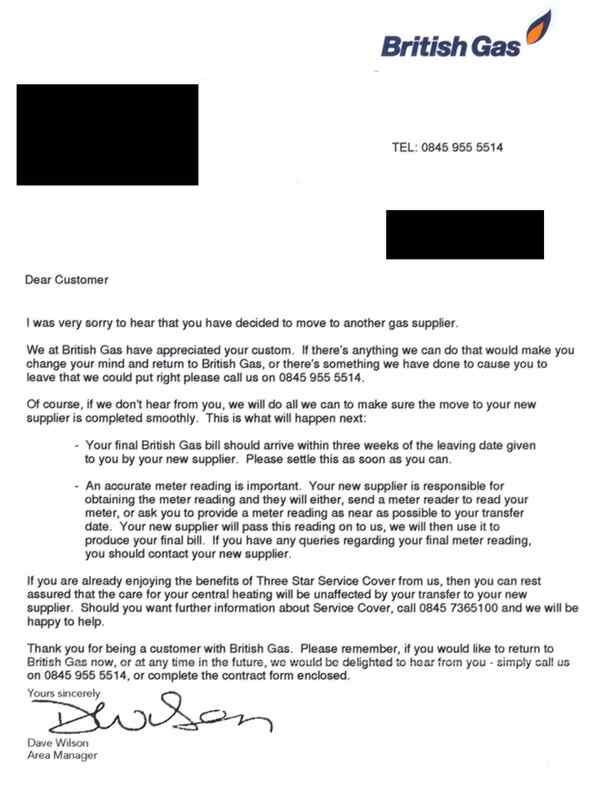 The word 'may' appears three other times in the letter. A new style of letter; to open it, I have to tear off a perforated strip. It is similar to the format used by banks to send out debit cards. "Dear Mr" has been reduced to "Mr". I am no longer afforded a civil courtesy. 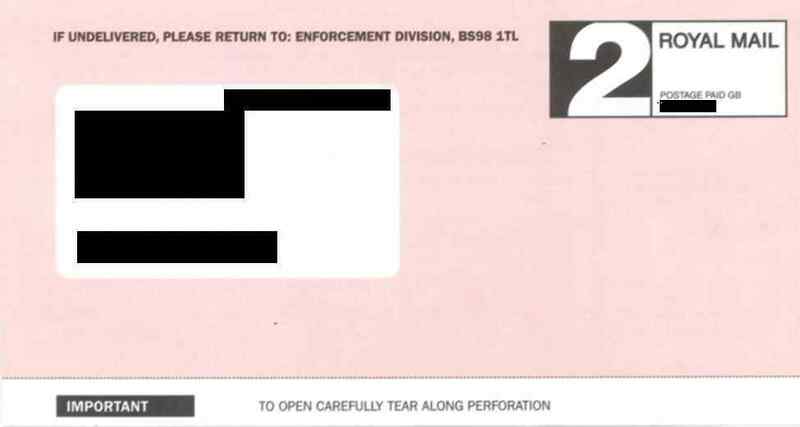 I also notice that my former licence number has been redefined as a reference number. 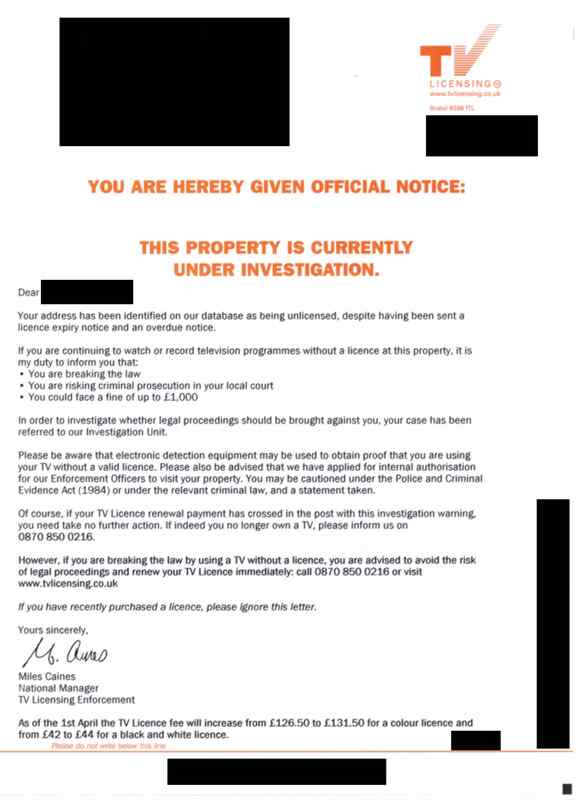 The third paragraph (again commencing "if") warns me that TVL/BBC will "consider" applying to my local Magistrates Court for a search warrant. They have inserted the name of my town Magistrates Court into the letter. 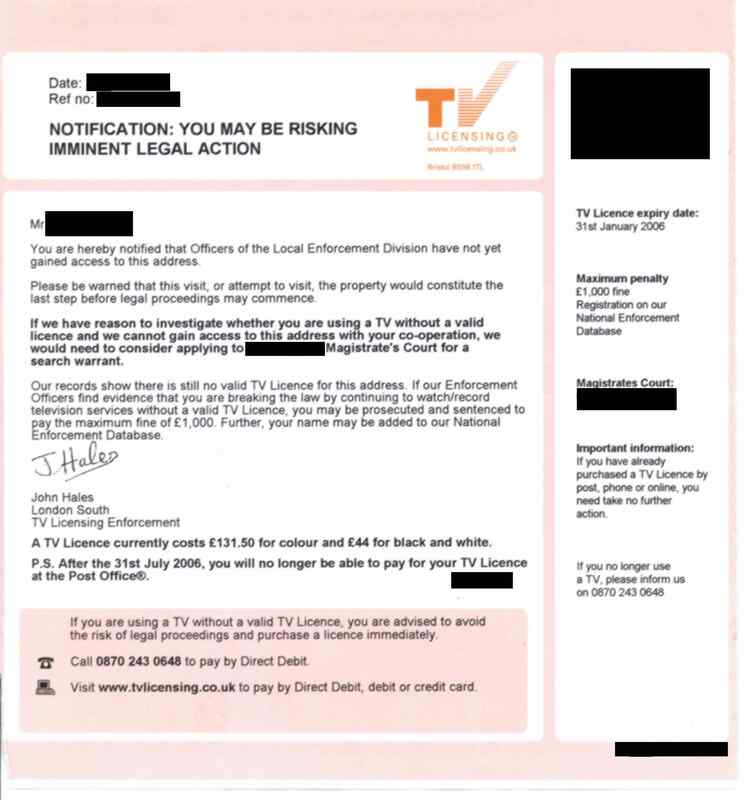 This gives the impression that TVL/BBC is close to legal proceedings; in fact, the effect is achieved by TVL/BBC cross-referencing a list of courts against postcodes on their mailing database. Note how the letters are stepping up in threat: in February, a final reminder; in March, I was under investigation; in May, a visit was authorised; in July, I am warned of a possible "search warrant" and "imminent legal action". I am intrigued by what TVL/BBC will do next. A new letter has arrived. The first thing I notice when I pick up the envelope is how flimsy it is; it can only have one sheet inside, not the sheaf of legal papers I was expecting. Secondly, it is no longer addressed to me by name, but to "The Legal Occupier". This letter is not a continuation of the previous correspondence. It makes no reference to the "imminent" legal action referred to in July, nor to the application for a search warrant. 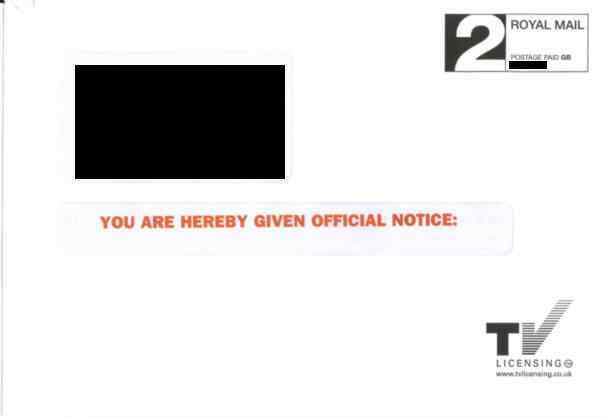 That my name has been replaced with "The Legal Occupier" suggests that BBC/TVL have deleted my details. The reference number which was previously the same as my old TV Licence number has been changed entirely, a point that gives me immense satisfaction (erased forever! Why did I not do this years ago?). So much for the build up of threats in the earlier letters. 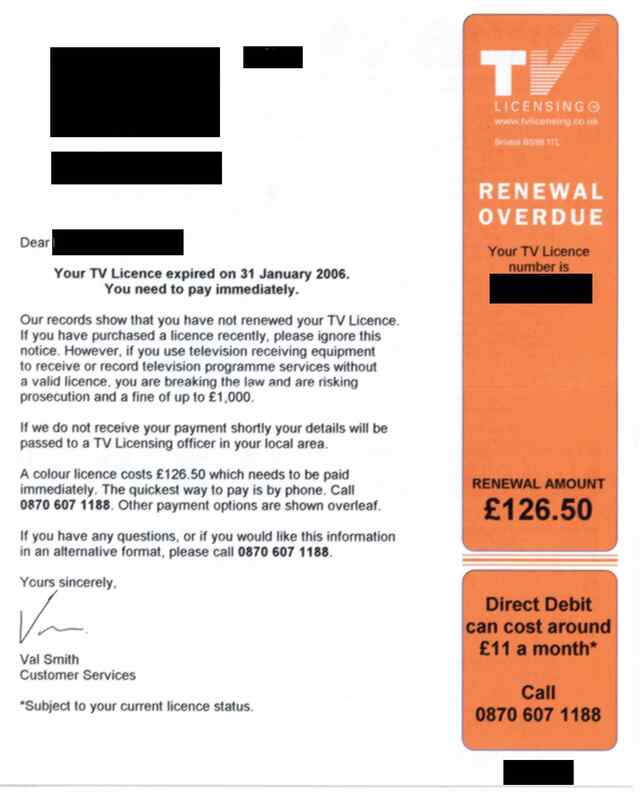 I wait with interest to see whether TVL/BBC do any better in their next mailing. Previous envelopes bore Royal Mail postal marks, but this one states "UK-Mail Businesspost". This is a bona fide company and their website is here. 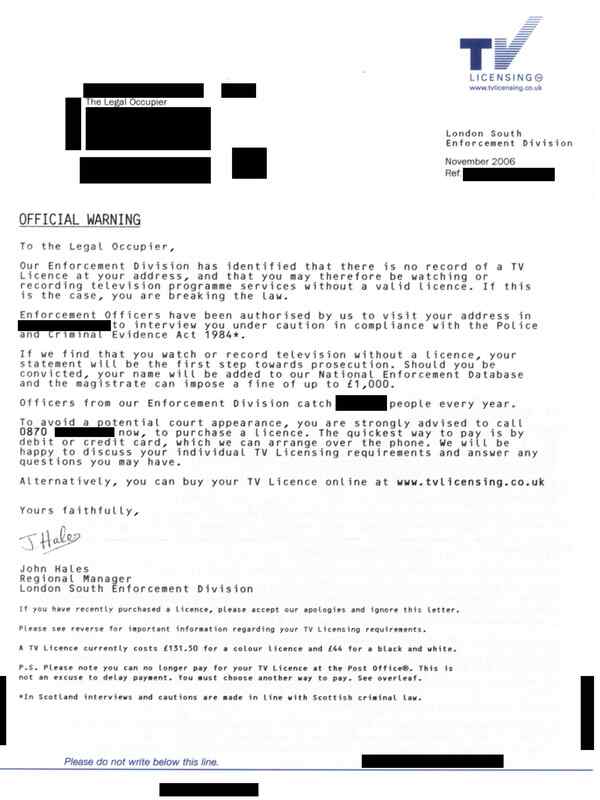 The first paragraph sums up the mindset of TVL/BBC in a nutshell, whereby the absence of a TV licence is seen as an indicator of watching broadcast television, rather than the other way around. The reference number at the bottom left edge is the same as the number in the bottom right, but only half visible; presumably someone else has the other half. This suggests that the letters are produced from a roll and guillotined vertically. As with previous letters, it says at the bottom, "Please do not write below this line". This seems a strange request; what would happen if I did, and how would TVL/BBC know? 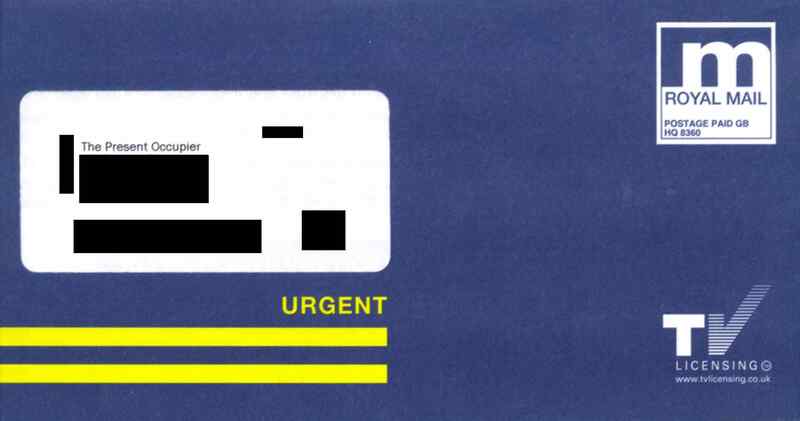 A blue envelope with yellow stripes. "Legal Occupier" has been changed to "Present Occupier". The first and second paragraphs say that, since I have not responded to letters over several months, my details have been passed to Enforcement Officers. 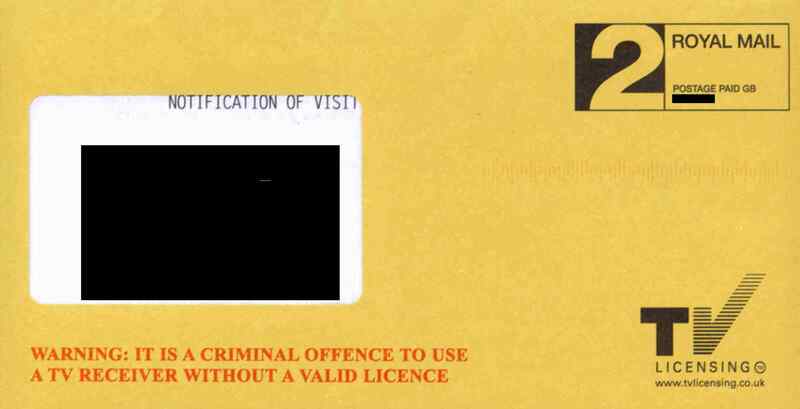 Yet, the previous two letters stated that Enforcement Officers had already been authorised to visit me, so the December letter makes no sense. As before, it is bluster. 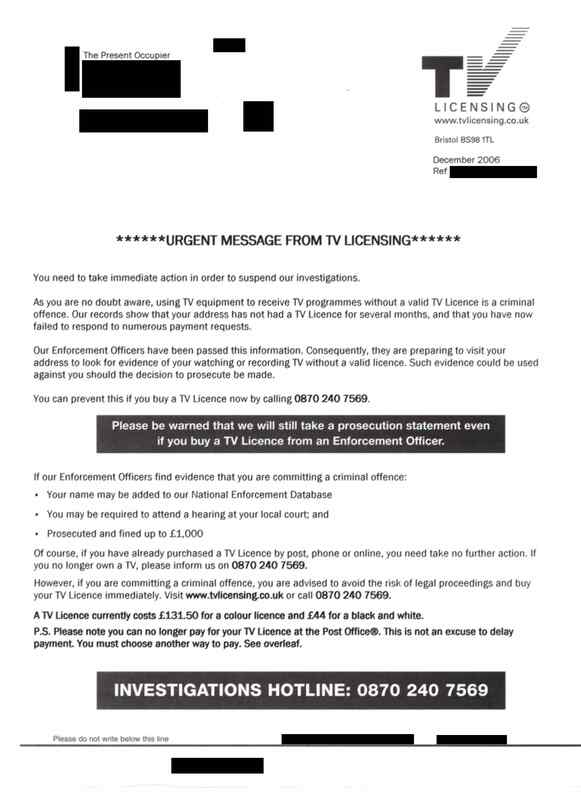 The second half of the letter gives me a number of options, for example, informing them if I do not have a TV, paying for a licence, or facing prosecution. The option of my right to disassociate is not included. No such courtesy from the British Broadcasting Corporation. Not once has the BBC sought to win back my custom by offering something positive; not once has it tried to understand why I no longer wish to pay for the BBC product. It is capable only of sending out letters that threaten and harrass.